One of the essential part of make-up is PRIMER! You need a primer, to prime your face; after washing and moisturizing your face, you need a primer for your make-up to stay fresh and long. Other essential part is to set your make-up, for that you need a Setting powder, which will help to set the make-up and prevent your face from looking oily and shiny for quite long. 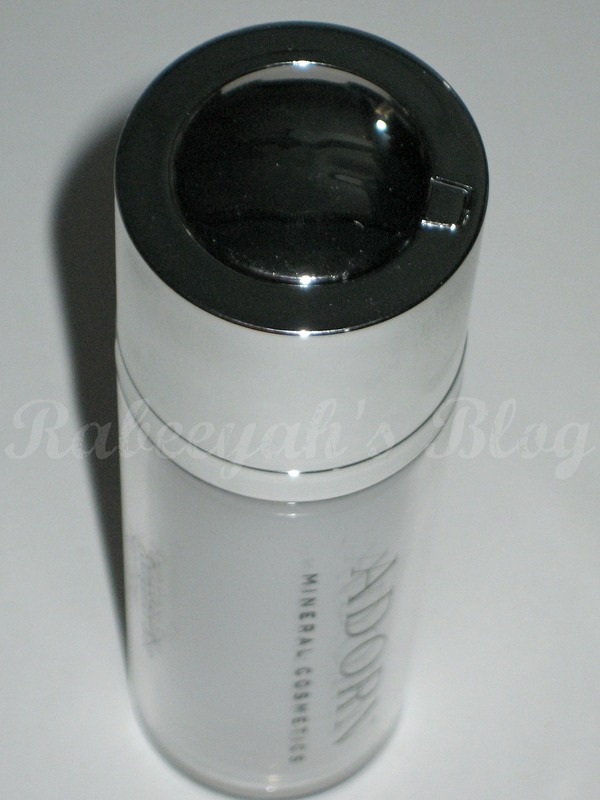 Today, my review is on Adorn Mineral Cosmetics Skin Primer and Setting Powder. 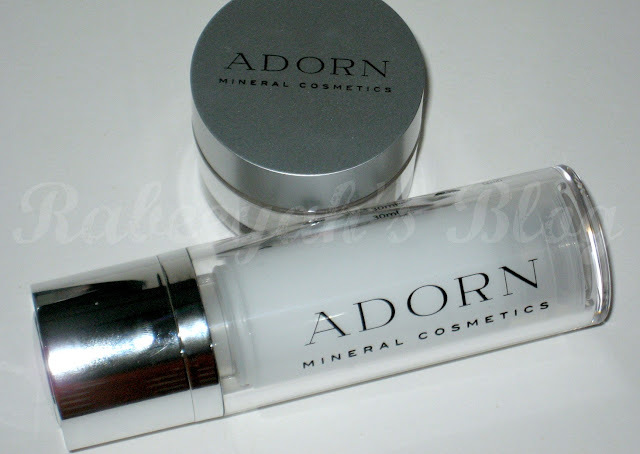 Adorn is 100% natural,TOXIC FREE, pure mineral and organic make-up suitable for women of any age, ethnicity or skin type. Our formulations are calming to the skin, making them ideal for women prone to sensitivities; and being fragrance-free, they are particularly compatible with delicate skin, giving a sheer, natural, flawless coverage. Adorn's eco-friendly and sustainable cosmetics are of the highest quality, celebrated by make-up artists, stylists, celebrities, dancers and models. Once Adorned you will never go back to using your old make-up again.! Packed full of Certified Organic Rosewater, Witch Hazel Extract and Grapefruit Seed Extract, Adorn'stoxic free, Skin Primer is particularly great for those who have dry skin or even an oily complexion as it allows foundation to disperse evenly. Your make-up will also last longer when using Adorn's primer and a moisturiser unnecessary for most skin types. I have never used any skin primers and now I know the difference between make up with primer and without it. Adorn Mineral Cosmetics Primer comes in a plastic bottle, which twists up. 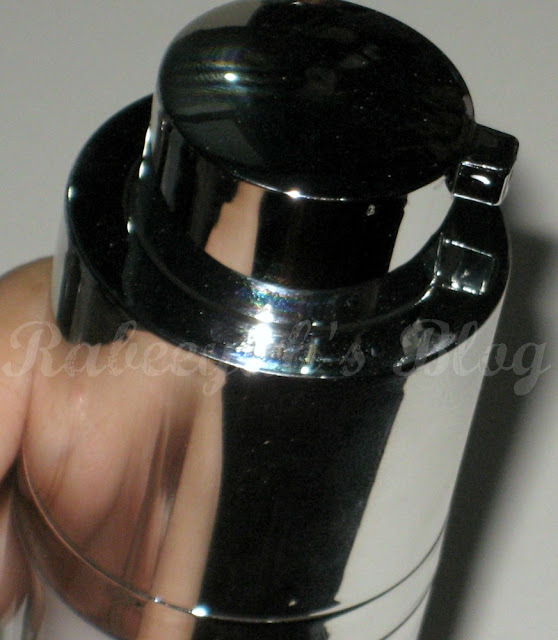 The bottle has another tube inside, which holds the product and rotates up and then you can pump out the product. I like the idea of it, this way the product inside is safe and neither there will be loss of product. The primer is white in color and is very light in weight. It has no smell. You need one pump of it, as little goes a long way; so this will last you long. I apply dots all over my face, and blend it. I tried it couple of times; I must say, it is an amazing product! I noticed a huge difference; when I don't use a primer and when I use it. It is one of the most important steps, for your makeup to last long and fresh. My make up stayed the same for couple of hours more then it usually does, without re-touching it. Or you can say, it was as fresh till I took it off. I have a combination to oily skin and I do face oily/shiny skin after couple of hours, if it is a hot weather; due to which I have to blot my face with a tissue. After using this primer, I must say, my makeup stayed the same for hours, even after blotting it with a tissue paper. I didn't notice any fading of blush or foundation, and it was fresh even after 4 to 5 hours. Primer not only makes your makeup last long, but also makes the application easier. After applying primer, it is quite easy to blend your foundation. I personally loved this product, and now I know how primer works and how important it is, if you want your makeup to stay longer and in the same state. I would definitely recommend you to get your hands over a good primer and if you can get your hands on this, do try it out! Want a longer lasting finish? 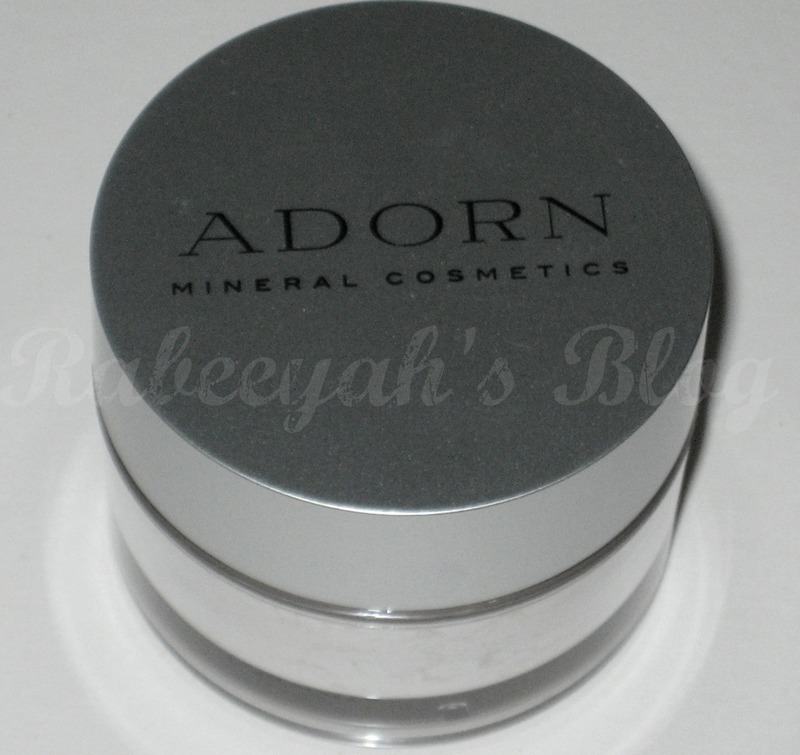 Adorn's Perfect Finish, toxic free, Matte Setting Powder is the answer! A light application over the top of your foundation and before applying blush and eye shadow, will set the make-up and take away any oily/shiny areas for a matte finish. Just like a primer, setting powder plays another important role. I have used compact powders and mineral face powders of my skin tone, never tried a setting powder white in color. Setting powders are good for all skin types, but more for those who has combination and oily skin. Dry skin types can stay good without setting powders over a foundation too,i.e. if they don't like. But for oily skin, setting powder is a MUST! For once I thought this powder will make my face white - which I hate! I was a bit scared to use it, but when I used it, it didn't make me white at all. Instead, it mixed in with my original skin color. It gives a matte satin finish (which it says) to your face, making your face look matte for hours. Don't use too much of it. I use it with my Bufffer brush, concentrating on my T-zone and working it out on the side, without taking extra powder. Good thing is, it doesn't make your face look cakey at all. But then again, don't use too much! Always use a powder brush to apply it. The packaging is compact and handy, you can carry around it in your make-up bag anywhere. Your brush will pick the amount your face needs, because of the holes in the plastic lid which covers the powder. Don't use a sponge or a puff. If after some hours, you feel a little oily, you can dust this powder on the oily/shiny areas. Always keep in mind to blot the excess oil with a blotting paper or a tissue paper. All in all, I like both the products. Both of them were new to me; tried both the products as well as the brand for the first time. 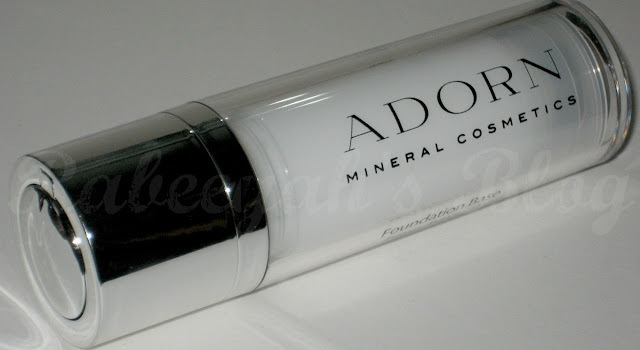 And I must say, I am impressed with the quality of Adorn Mineral Cosmetics. From packaging to products. Though, both of them didn't come in a box, but were nicely packed and nothing was damaged. I hope this review was helpful. Share your experience with a Skin Primer and Setting Powder. Its an informative posting and I like it. Really excellent site and your topic is informative and appreciate able.